Aix-Maurienne Savoie Basket (ProB) strengthened their roster with addition of 23-year old Cameroonian international forward Benoit Mbala (203-104kg-95). 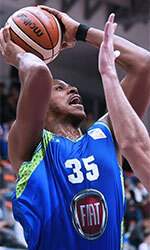 He started the season at Seoul Samsung Thunders in South Korean KBL league. In 18 games he recorded very impressive stats: 20.6ppg, 8.8rpg, 1.6apg, 1.4spg and 1.1bpg this season. The most of last season Mbala spent at Chorale de Roanne where in 24 ProB games he averaged 11.8ppg and 5.5rpg. He helped them to make it to the final. Mbala also played for Fuerza Regia (LNBP) in league. In only one game he had 8 points and 2 rebounds. He won Philppines UAAP championship title in 2016. Mbala also represented Cameroon at the Afrobasket Championships two years ago. His stats at that event were 4 games: Score-2 (21.8ppg), Reb-2 (9.3rpg), Steals-5 (2.0spg), FGP: 57.9%, 3PT: 31.8%, FT: 71.0%. Mbala has played also professionally in Philippines (Green Arches).